Well here we are– we’ve made it one week in Japan. Exactly one week ago right now, we were about an hour out from Tokyo and were getting situated in the airplane to be able to land. It was at this time that I finally became a little sleepy and caught at 15 minute nap at the end of a 12 hour flight. Anyway, we made quite a spectacle, with a baby and a stroller and 10 loaded suitcases. We had to have an airport lady help us push the carts through and out of customs. We were quite literally a caravan. There are still moments where we can hardly believe we’re here. But people were looking forward to our coming, which is always encouraging. Rosalyn, as if you had any doubts, is well loved here. Certainly the star of the family, she has adapted pretty well to the time difference (thank you for praying) and to the cold and to being carried in the “carrier” a lot. 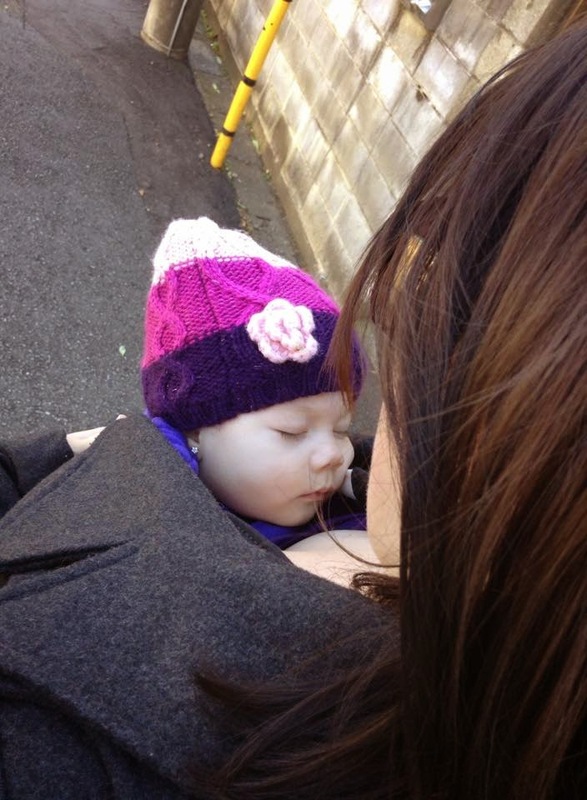 We see more Japanese women carrying/wearing their babies as compared to pushing them in a stroller. It’s certainly easier than carrying a stroller up and down from the 3rd floor. -We found an apartment we like love. Well– we’re waiting for an answer, which we hope will be received tomorrow. Sometimes landlords do not like to rent to foreigners, and some families here have been rejected in their application of renting a certain apartment. Still we know that God has the perfect place for us, and if it’s not this place, it’s something better. -Vicente got registered to start school in January. Some of the other team members are going to the school so it seems we are well known as being part of the church group. 🙂 It was awesome to see my teachers from the past– I was surprised some of them remembered me! They were excited to meet Rosalyn as well. My Japanese is coming back surprisingly well! I’ve been able to manage a lot of situations on my own and carry on conversations. I even made a new friend on the airplane who lives about a half-hour away and we plan to have a play date sometime next week or the following week. But I am thankful to God, who I know is the one who is helping me to recall words that I didn’t often use in Japanese and now can quickly remember how to carry on. We’ve went to the Fuse Leadership Training, church service, small group, prayer meeting and have had lunch/dinner with different members of our team. So, we are getting involved here slowly, but are excited at the doors that God is already opening. Will be writing more later!